Because of its close proximity to Mount Rushmore National Memorial – only 2 miles away – Keystone, South Dakota calls itself the home of Mount Rushmore. Enjoy a relaxing two hour train ride between the historic towns of Hill City and Keystone. The 1880 Train is the perfect way to see the Black Hills! Beautifully rustic yet fully modern cabins in the heart of the Black Hills, minutes away from Mt Rushmore. Only 4 miles from Mount Rushmore, the Four Presidents Lodge is the closest hotel to the monument. An exquisite Bed and Breakfast Lodge with luxurious rooms, jet tub, private bath. Enjoy a western-style breakfast to start your day of adventures. Visit this eclectic Bed and Breakfast just 4 miles from Mt. Rushmore. Open year round and features Jacuzzi tubs and Queen beds in each room. Private decks available. You know the hotel chain well. Now there is one in Keystone. Full hookup RV Park or rustic log cabins. The choice is yours! Pull-through sites, picnic tables, free WiFi. Forest setting with fresh air. 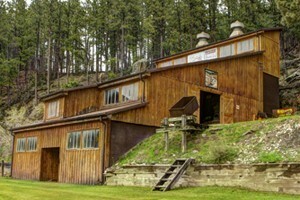 Cozy lodge suites, private hot tubs, a lovely dining room ... all near hiking trails and Keystone attractions. Realistic wax renditions of every US president dramatize historic events that shaped our nation; gift shop on-site plus nearby mini-golf and grill. A great restaurant, museum, and live entertainment. Located just east of Mount Rushmore, explore the twisting passages of the Black Hills Cave. Guided tours and a gift shop available on site. Custom built log cabins bordered by the Black Hills National Forest and just minutes from many of our areas most scenic attractions. All varieties of fudge in downtown Keystone. Customers rave about this delicious deli ... located right in the heart of Keystone. This isn't just your standard deli, it has character. Keystone is only 2 miles from Mount Rushmore. Despite its small population, Keystone has many lodging and eating facilities as well as several museums. The small community of Keystone, population nearly 500, has transformed itself from a mining town at the turn of the century to a thriving Mecca for tourists who come to the region to visit Mount Rushmore. In addition to its immediate proximity to Mount Rushmore, Keystone is also known as the home of Carrie Ingalls during her adult years. If you’re headed to Mount Rushmore, you’re headed to Keystone, SD. 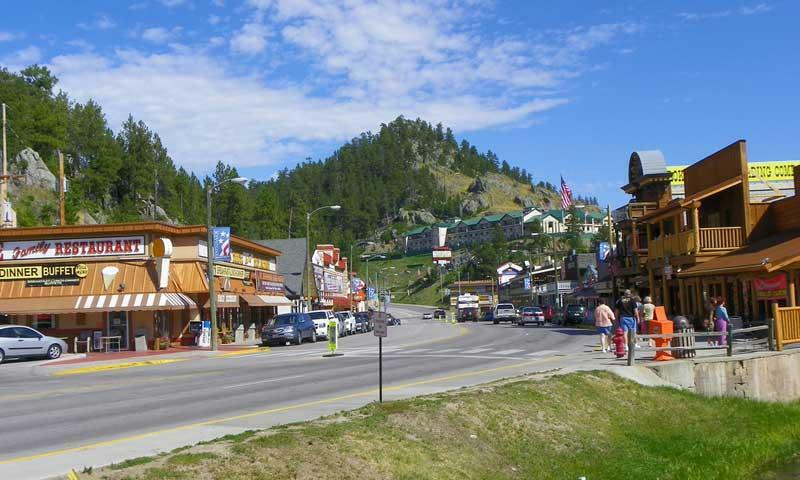 Located only 2 miles from the famous icon, Keystone is in the heart of the Black Hills region. Because there are no lodging facilities located at Mount Rushmore National Memorial, Keystone is your closest place to stay. Despite its very small population – roughly 500 people – Keystone can offer the family or individual a variety of lodging options, a multitude of gift shops, and several good restaurants. 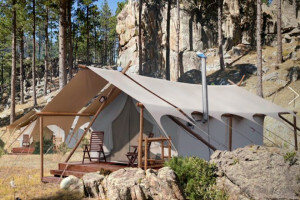 Hundreds of campsites and cabins, and many great attractions are also very close. The Keystone-Mount Rushmore area provides easy access to several outdoor activities from hiking and biking to hunting and fishing. Horse Thief Lake which is located behind Mount Rushmore on Hwy 244 provides excellent trout fishing and when Grizzly Bear Creek and Battle Creek are running through the town, they are also great places to fish. There are also designated areas for exploring caves, climbing, and horse back riding. Keystone is filled with various museums where you can learn about Mount Rushmore, various United States Presidents, the town itself and Carrie Ingalls of the Little House on the Prairie Book series. There is also an alpine slide and a tramway, a gold mind and a 1880 train. And don’t forget to check out the historic walking tour that takes you on a trip back in time! Rapid City, SD is easily found along Interstate 90 in the western central area of South Dakota. Keystone can be found 22 miles south of Rapid City, along Highway 16A. The Keystone Historical Society provides an in depth historical account for the area.